I’ve been slowly working on the wall decor in both Zachary’s and Gabbie’s rooms. Here’s an update on their “gallery walls”! 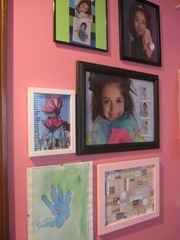 Gabbie’s wall started out with the middle photo of her within her ballet / tap outfit from last year. This year, we had her photographed in her jazz outfit, which is seen on the top right. To the left is her regular 7 year old photo. 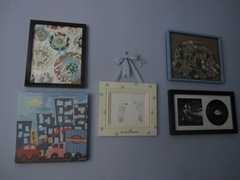 Next to the large middle ballet photo is a print from etsy, via my mom. It is from this store, which seems to have a lot of very nice photography! On the bottom is Gabbie’s watercolor art from camp, and my own creation – a framed piece of scrapbook paper which I had in my stash. 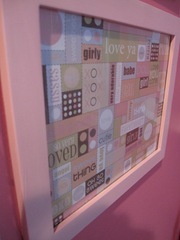 I painted a white frame pink and there you go. I have a few more ideas for this space, as well as the space over her bed, so stay tuned! On a different wall in Zachary’s room, I added these awesome hooks! 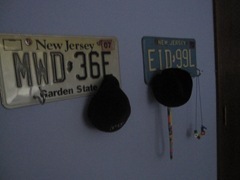 I got the idea here, but instead of gluing on the hooks, I got hooks that screw into the wall, and used them to hold the license plates up. (I also used nails in the top holes). The blue license plate came from my first car – an ‘88 Oldsmobile (which I remember my parents buying during the 1988 summer Olympics!) and the yellow is from our Santa Fe that we drove from NJ to Kansas and then traded in when we got our van. 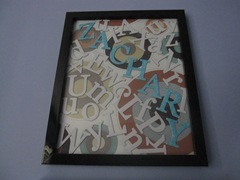 We think they make a great addition to Zachary’s room!